In the past, if you wanted a solar-powered gadget, you typically had to shell out a lot of cash for something made by a company you'd never heard of. But that's starting to change, as major brands such as Kodak and Energizer have recently entered the solar-electronics market. And more products are in the pipeline, which is especially good news for those of us living in the hurricane-prone Sunshine State. Most of the solar products on the market are portable chargers that allow you to charge a cell phone, MP3 player, camera or other portable device. And now that so many gadgets can be charged with a USB cable, it's no longer necessary for companies to make solar chargers that require lots of tips to fit different products. There's also a solar Bluetooth headset (the Iqua Sun, which I reviewed last year), and a solar Bluetooth speaker phone for your car, which I reviewed at OrlandoSentinel.com/techblog. Eventually we may see a solar cell phone, as both LG and Samsung have shown off prototypes. This is a pretty ingenious device because it's compact, can be charged in several ways and it serves a few different purposes. It fits in the palm of your hand and it has a plastic hook so you can hook it to a backpack. It comes with two rechargeable AA batteries, which are used to store the solar energy and power your gadgets. To fully charge the batteries, leave the device in the sun (or by a window) for about 28 hours, or use the included USB cord to charge the batteries with your computer or with a USB power adapter. To charge a device such as an iPod or BlackBerry, just use a USB cable to connect it to the port on the Kodak solar charger. If you need to use a device that runs on battery power, like a digital camera, just remove the batteries from the charger and put them in your camera. 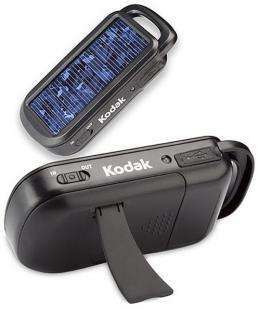 Kodak says when the device is fully charged, it can deliver 1.5 charges to a cell phone (0.75 charges to iPhone/BlackBerry), run an MP3 player for 33 hours, or allow you take about 300 digital camera pictures. This charger is bigger and more expensive than the Kodak, but it does charge up faster and provides more power. It's about the size of a large wallet, and the device contains three solar panels that fold up when you aren't using it. The unit can fully charge after about six hours in sunlight, and it comes with an AC power adapter. Another nice feature is there are lights to indicate how much power is left in the solar unit. Like the Kodak, it has a USB port to charge gadgets, but it also comes with six tips so you can charge other devices. It can provide 60 hours of run time on an iPhone or 12 hours of cell-phone talk time. Energizer will soon start selling another solar charger, the SP1000, which is comparable to the Kodak charger. It's smaller and will cost $50. Weather-radio maker Eton Corp. sells several devices that use solar power to do a bunch of different things, such as charge a cell phone (via USB port) and power a radio and flashlight. Each gadget also includes a hand crank so you can instantly power the device. The higher-end models also can serve as portable speakers and be powered by AA batteries or AC power. These radios are a great addition to a hurricane kit because they are affordable and practical. I tried the Microlink FR160 ($30), which is a handheld unit, and the Solarlink FR500 ($80, or $50 at Costco), which is a larger, boombox-style device. I wasn't a big fan of the Microlink because there are only two ways to charge it: by cranking it or leaving it in the sun, and the radio is not digital. The Solarlink can run on batteries and AC power (though an adapter is not included) and it has a digital weatherband and AM/FM radio. It also has an auxiliary jack so you can use it is a speaker system for an iPod or other devices. One important distinction is that to charge a cell phone (or other device via USB), you must either use the hand crank or be in direct sunlight. And on the Microlink, you can only use the crank for cell-phone charging.